Currently digging and shipping comfrey. If you make an order, you can expect your package to arrive within 2 weeks. If you do not want your package at that tiem, tell us by leaving a note in the “order notes” field at checkout. 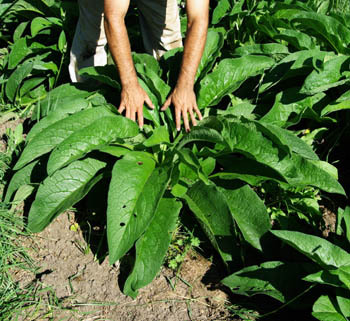 Comfrey is best planted in the early spring or fall. Herbaceous perennial flowering to 3 feet, a hybrid of Russian Symphytum asperum and European Symphytum officinalis. Bocking 14 cultivar of Russian Comfrey (Symphytum x uplandicum). Sterile hybrid does not make seeds. 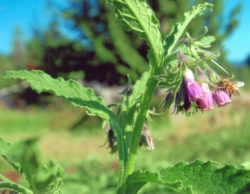 Uses: Comfrey is commonly used in permaculture as a companion plant to fruit trees. In the nursery, we have great results making the fresh leaves into biodynamic tea, which we apply to our plants in a pot to increase vitality, growth, and to green up all those leaves! Excellent ingredient for compost piles–fresh leaves compost fast and make a nitrogen-rich compost! Fresh, rubbed leaves fed to ruminants, pigs and chickens to increase health and as a protein-rich nutrient dense feed. 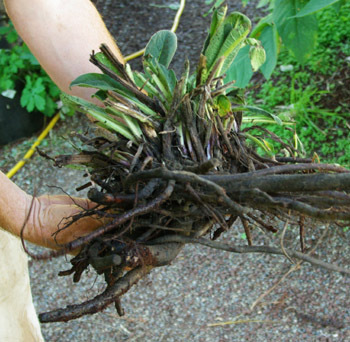 Traditional usage of fresh or dried leaves or roots (TWM): used externally to speed healing. Source of cell-proliferating molecule alantoin. What is a root crown cutting? A chunk of the crown of the plant (the blocky part above the taproots), often with a piece of the taproot attached. Size is variable. 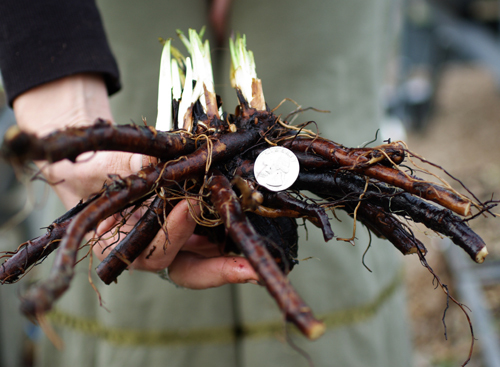 We give generous cuttings, from 2 to 6 inches long, generally as big around as your thumb, often larger, sometimes smaller–a mix. These are the SAME CUTTINGS that we use for replanting our own fields, and horticulturally speaking, this is the best size and shape to replant in order to get fast results. This is NOT just a piece of the taproot, which generally takes longer to grow to a full sized plant than the more desirable crown cutting. How to plant: Space the plants at least 2 feet apart. Comfrey prefers rich soil of medium moisture in the sun to part shade. It is a heavy feeder and will reach monumental size if given composted manure under the cutting at transplant and/or around the crown of the plant during the growth cycle. To plant the cutting, prepare a weed-free area of 1 foot square, fertilize the spot with compost, then bury the cutting in the center of that spot, completely covering the cutting with soil to the depth of 1 or 2 inches. Do not leave the cutting exposed–let it sprout spontaneously up through the soil. This will take about 2 weeks–you will see the bright green leaves emerging. How to care for comfrey plants: Keep the planting reasonably well watered. It works very nicely to mulch the plant with straw, other high-carbon mulch, or even its own leaves, cut from the plant and laid back down around the crown. 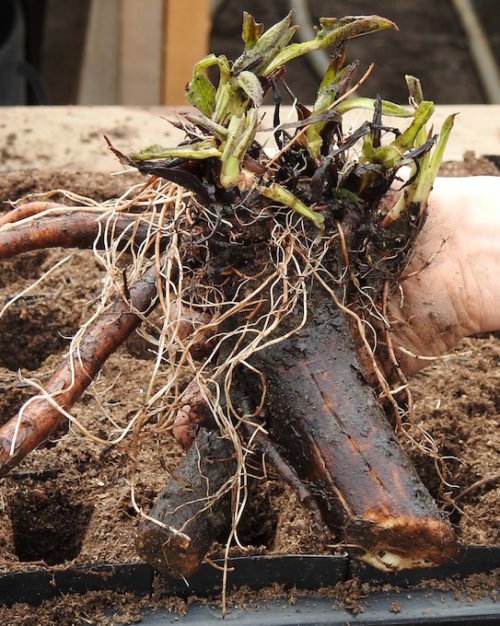 This is the standard way to take care of comfrey–when it finishes flowering and starts to keel over, cut it down and use the leaves for any of the multitude of applications comfrey leaves are good for, or simply lay the leaves back down on the crown of the plant and let it grow back through its own mulch. In the temperate zone, this cycle usually occurs 2 or three times per summer. The only way to get rid of comfrey is to stop watering it and let the plant dry out, or to drown the plant in water. Otherwise, the plant will stay put where you plant it, unless you dig through it or rototill or plow the area, in which case new plants will come up from root fragments wherever they are deposited. Many people plant comfrey in the orchard, as it brings up minerals from deep within the earth that are good for fruit trees, and because it nourishes the trees with its fallen and composted leaves. 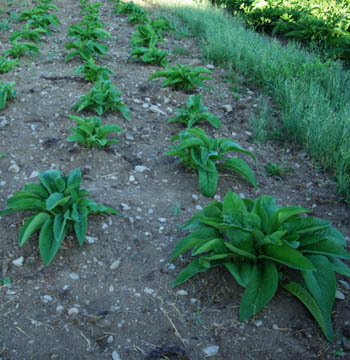 The above directions are suitable for comfrey culture in orchards, and traditionally at least one plant is planted per tree. You can mow over the plants if necessary–they will re-emerge. I live in N. Wisconsin, can I plant comfrey now in October…will it survive the winter and sprout in Spring? I can’t see much advantage in planting the comfrey now, I think it would be better to wait until the spring. We bought 6 of these and all grew well. So well in fact we probably could have bought less, as we have successfully been splitting them each of the last two years. They are great for our fruit trees and chickens! I’m in zone 4a and have been told last frost is usually around June 1st here. What date range would you recommend for planting these here? Thanks! Is this really only hardy zone 4-8? I read online that someone recommended this variety and was growing it in Florida zone 10. I am zone 9B, can provide adequate drainage, and am looking for a comfrey variety that will thrive here for a chop and drop mulch. The Russian Bocking 14 is probably the most widely adaptable. I have had feedback from Z9 folks that comfrey “melts” in the summer heat but have no doubt that under the right conditions it can make it even in tropical zones. Are you sure Bocking 14 doesn’t make any seeds? I’m thinking they make seeds, but the seeds are sterile. I’m definitely hoping that is the case since I got some claiming to be Bocking 14 and they are making seeds. Was looking to buy more but now I am cautious. I make a comfrey/plantain salve with it every spring. I love it. After planting root cuttings early last spring near my fruit trees, the comfrey took off quickly to become large, robust plants. All during summer and fall I continued to cut leaves back and the plants rapidly re-grew. I used the leaves I cut for comfrey tea to pour around the fruit tree drip line; for dried plants that I powdered and sprinkled into tomato planting holes; and chopped up in my compost pile. Even in our sustained high summer heat above 105 degrees for weeks at a time, as long as I gave the comfrey some water it continued to grow. Now comfrey is my favorite permaculture plant for my small orchard and I plan to buy more root cuttings this year.